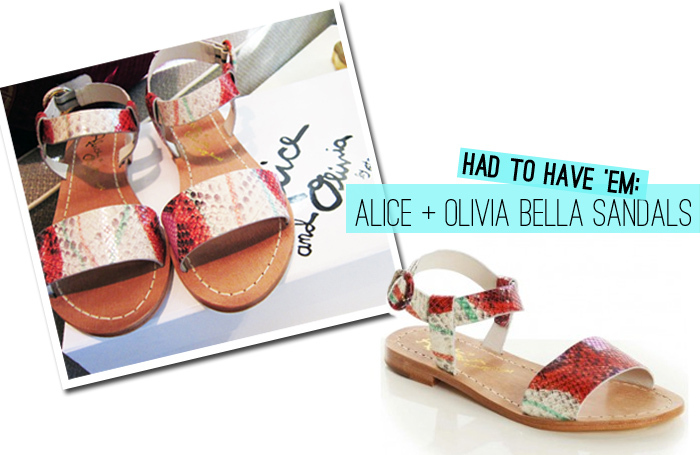 The latest addition to my closet: Alice + Olivia’s Bella Sandals. I spotted these on Shopbop this week and just had to have them. I adore the variety of colors (bright pinks, reds, and pops of green) against a neutral backing, and the snakeskin adds such an interesting texture. They’re just as good looking in person! Not to mention, they’re incredibly comfortable. What more could you ask for in a summer sandal? I have these in the wedge. Love them! After seeing these sandals I had to have them too! Cannot wait for them to arrive.